The automotive parts industry has seen its digital transformation turbocharged by a number of powerful forces. First, the sector has been on a positive run, given slow car sales in recent years. When people keep their cars longer, they are more likely to buy parts to repair or improve them. And of course, more people are buying more things online — including purchases that in the past would prompt shoppers to head to physical stores so they could kick the tires, so to speak. “The Automotive Industry’s Digital Transformation,” Signifyd’s latest installment in its Risk & Reward series, takes a deep dive into the industry changes and market forces that are driving the auto industry’s future. Technology, market forces and consumers’ changing shopping habits are all driving the automotive industry in new directions. 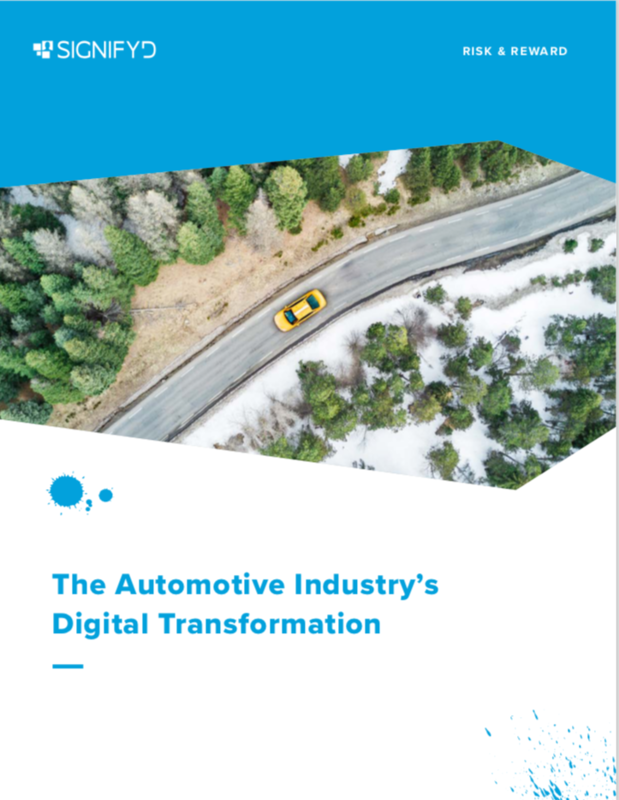 Download “The Automotive Industry’s Digital Transformation” to learn more about where the industry is going and what it means to you. Most of the signs are positive, with analysts predicting record sales by 2020. But there are questions around how innovation and social changes, like electric vehicles and ride sharing services, will alter the forward progress of retailers who sell auto parts. More recently, a simmering trade war between the United States and China has cast some uncertainty on the market. And — spoiler alert — retail giant Amazon is making aggressive moves into the sector, a development that has yet to play out entirely in the auto parts sector, which traditionally has been populated with well-known names in the brick-and-mortar space. In fact, both Amazon, with its huge marketplace, and eBay, which is a huge marketplace, are moving beyond business-to-consumer auto part sales and exploring business-to-business models. But all indications are that the aftermarket auto parts sector will continue to grow, fueled in large part by online sales, which are increasing at an annual clip in the double-digit-percentages. And developing markets, such as India, provide promising growth opportunities. As with any sector in the process of seeing more online sales, the auto parts industry may find it is more vulnerable to fraud, as fraudsters look to feast on those who are relatively inexperienced with online sales, or unaccustomed to the scale of the online businesses they find themselves creating. Such biases, obviously, don’t do merchants or their customers much good. And there is no doubt that in the case of automotive, it could lead the sector to stall. Reach Mike Cassidy at mike.cassidy@signifyd.com; follow him on Twitter at @mikecassidy.